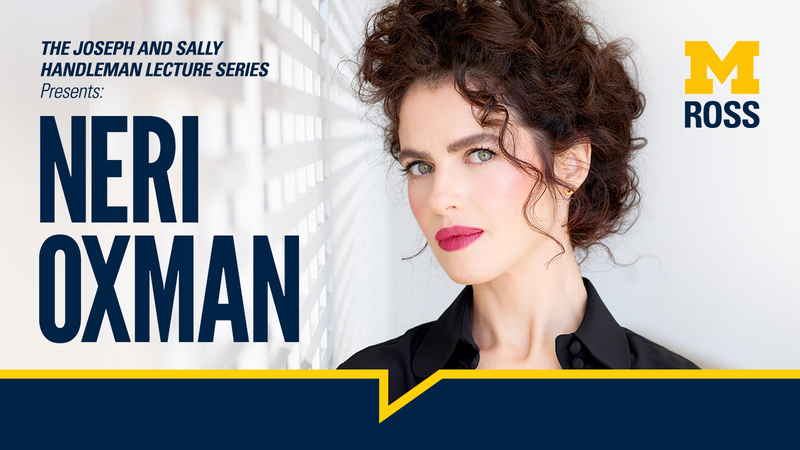 This week, Michigan Ross welcomes Neri Oxman, award-winning architect and designer, as the guest speaker at the annual Joseph and Sally Handleman Lecture Series. Oxman will discuss how her breakthrough creativity model known as the Krebs Cycle of Creativity can help organizations break down silos and improve collaboration and communication in the workplace. The event is free and open to the public. Oxman is the director of the Mediated Matter Research Group at MIT, a group focused on the intersection of computer science, material engineering and design, and ecology. She coined the term, and has pioneered the field of, Material Ecology, an approach that interconnects the design and engineering of buildings and products with nature. Oxman’s work is included in permanent collections, including at the Museum of Modern Art (MoMA), the San Francisco Museum of Modern Art (SFMOMA), and the Smithsonian Institution. See more of her work, exhibitions, and awards at http://matter.media.mit.edu/. Michigan Ross launched The Joseph and Sally Handleman Lecture Series in 2013 through the generosity of the Joseph and Sally Handleman Charitable Foundation.